One of my favorite pastries at Panera is the Cobblestone muffin. 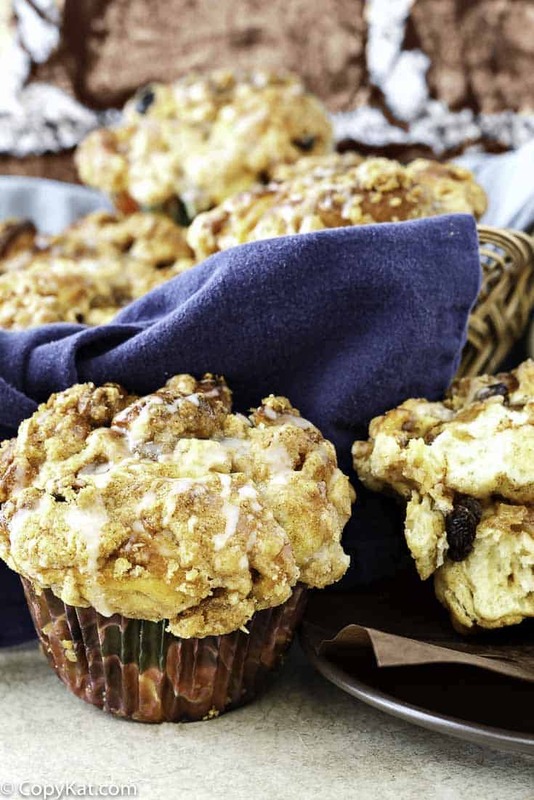 Enormous, craggy muffins loaded with spiced apples, cinnamon and raisins, topped with streusel and icing. What is not to love? When I really love something from a restaurant, especially a chain restaurant that lists their menu ingredients online, I go over and try to figure out how to replicate my favorite as closely as possible. I am very pleased to say that I think I have done it with these muffins. you will definitely have a head start. There are a lot of components to this recipe: the bread base, cinnamon-raisin filling, spiced apple filling, streusel, and icing. If you’re up for a day spent in the kitchen, enjoy. You’ll be rewarded with the closest you can get to Panera without having to get in the car. If you would rather not work quite so hard for your sweet Cobblestone reward, there are a few ways you can go about simplifying this recipe. I will make note of them at the end of the recipe. I love Panera Bread, they have made a good effort in making sure their food has ingredients we can all spell and say simply. They are all about everyday food. It makes it easy for you to modify a recipe by changing out ingredients that work best for you. Looking for some more great breakfast ideas? Be sure to check out these recipes. This recipe is from Jenni Field from the Online Pastry Chef, be sure to check out more of her recipes on her blog. 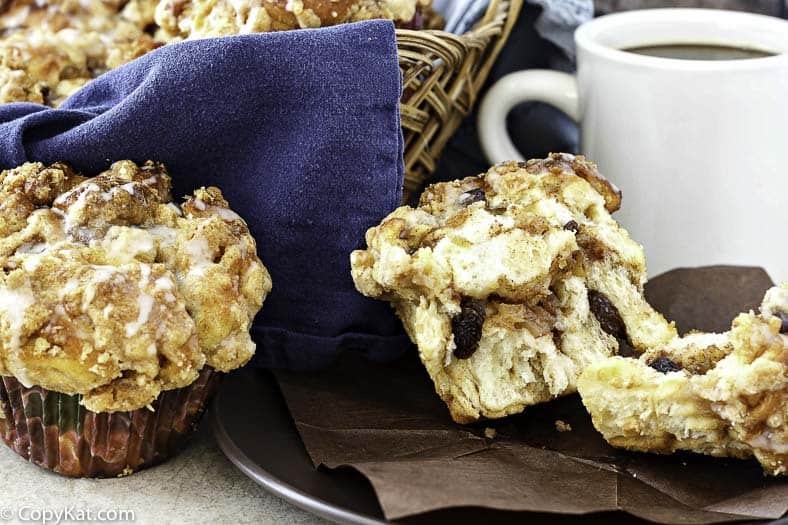 Do you enjoy the Panera Bread Cobblestone Muffins? Make them at home. For the Dough Put the water, butter, sugar, egg, and salt in the bowl of your stand mixer. Stir briefly with a whisk. Add the flour, and then add the yeast on top. Mix on low speed with the dough hook until a shaggy dough forms, about 1 minute. Increase speed to medium and knead for 10 minutes. The dough will be soft, very shiny, and supple. It will also be very soft. Don’t worry about that--we want a soft dough. Leave the dough in the mixer bowl, and scrape it into a ball, spray with pan spray, and cover with plastic wrap. Let rise in a warm spot until doubled in size, about 1 1⁄2 hours. For the Cinnamon Raisin Filling Using a whisk or a hand mixer, mix all the ingredients except the raisins together until smooth. Reserve the raisins for assembly. For the Spiced Apple Filling Using a chef knife, or a mini-prep, chop or pulse the apples until the pieces are about the size of small peas. You don’t want it completely smooth like applesauce. Think more like salsa. Stir in the salt and cinnamon chips, if using. If not using cinnamon chips, stir in the ground cinnamon and set aside. For the Streusel Using 2 forks, a pastry blender, or your fingers, mix all the streusel ingredients together until sandy with little clumps of butter. Set aside. Line 2 jumbo muffin tins with jumbo muffin liners (you will only need to line 3 cavities in the second pan since this recipe makes 9 muffins). For each muffin, you’ll be using 3 of the “cinnamon rolls.” Cut the first in 4-5 pieces and put them in a lined muffin cavity. Top with a spoonful of apple filling. Repeat twice more with the second and third “cinnamon rolls.” When finished, you’ll have a muffin with 3 layers of cinnamon roll and 2 of spiced apple. You will be filling the muffin cups almost to the tops. Continue making muffins with the rest of your dough and apple filling. Evenly sprinkle on the streusel, dividing it evenly among the 9 muffins. Cover muffins and let rise in a warm place until puffy, about 45 minutes. While muffins are rising, place a rack in the center of your oven, and preheat to 350 F. Bake until golden brown and well risen. The internal temperature of the muffins should be about 195F, give or take 5 degrees. This will take about 30 minutes. If the muffins seem to be browning too quickly, loosely tent with foil. Let the muffins cool for 10 minutes and then remove muffins to a rack to cool completely. Once cool, use a fork to drizzle each muffin lightly with the glaze (instructions below). For the Glaze Whisk the ingredients together until smooth. You can wait until the muffins are cooling after baking to do this part. Ways To Simplify the Cobblestone Recipe Start with store-bought sweet dough, such as the type made by Rhodes Bake-N-Serv. Instead of rolling out the dough and making “cinnamon rolls,” you can also roll the dough into ping pong ball-sized balls and dip them into the cinnamon mixture and roll them in raisins. Use an equal number of balls for each muffin, making sure to add in the apple mixture. Leave out the apple mixture entirely. You can also leave off the streusel or the glaze if you prefer.Make a Cobblestone coffee cake by making the whole thing in a well-greased tube pan or springform pan. So glad you had this recipe. They aren’t in my local Panera anymore. Maybe its a typo but if I cut 9 “cinnamon rolls” into 3 pcs I get 27 not 18. Im sure 3 per muffin is correct but then you only get 6 muffins. Also tried with golden raisins and dried apricots , good stuff. I also made a breakfast pudding type thing to spread the calories out. I just went to my local Panera this morning to get a Cobblestone and didn’t see them in the case. When I asked, she said they discontinued them! I am so glad I found this recipe because life is just too short not to eat one of these every once in awhile. I will miss going to my local Panera (which to next to my favorite public library) and reading my new library finds while drinking a hot chocolate and snacking on one of these muffins on a cold day. I am glad you have a recipe you can use!